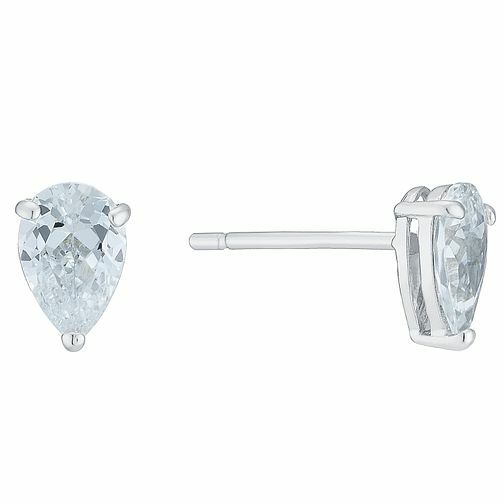 A glittering pair of cubic zirconia stud earrings in a teardrop shape, finished with a chic 9ct white gold setting. A timeless gift and a staple for any jewellery collection. 9ct White Gold Cubic Zirconia Teardrop Studs is rated 5.0 out of 5 by 1. Rated 5 out of 5 by Anonymous from Perfect Bridesmaid gift! I bought four pairs of these for my Bridesmaids and they are perfect... I can't wait to give them to them on the day. In the picture online I would say they look blue but they aren't at all, they are clear.... Didn't matter to me though, Loved them!